I've moved a lot, and one of the very few things that I like about doing it is the opportunities it presents for change. New habits, which I find next to impossible to begin under normal circumstances, are practically effortless in a new home and a new town. One of the things that I've been trying to do since we moved into this apartment is get rid of stuff. While I still can't seem to throw papers away ('They might be important! '), I'm making progress on most other fronts -- particularly clothing. So as the weather cooled down and my teeny-tiny closet started getting full with heavier clothes I started pulling things out that I just don't wear in preparation for a trip to our local Goodwill. I came across my first-ever sweater. 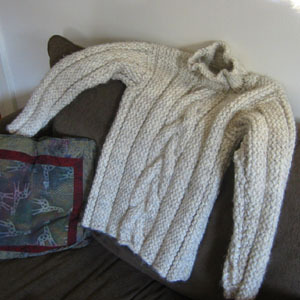 You might remember this as the twisted-stitches sweater, or the slightly-too-small sweater. In any case, I know I'll never wear it. I'm allergic to wool, and it's just small enough that I can' t wear a turtleneck under it. As it is I'd end up clawing at my skin if I tried to brave it. I felt a bit sentimental as I debated whether or not to keep it. Sure, it was a bit of a failure... but it was my first sweater! In the end, it was its warmth that swayed me toward giving it away. The sweater really is very, very warm and Boston winters really are very, very cold. I tossed it on the "donate" pile -- if I won't wear it, hopefully a smaller, less allergic person will. Lucky small, less allergic person! Very generous of you to donate the sweater. I'm sure it will be much appreciated.